[2011-07-12] ESM 2013 to be held in Cargese, Corsica, France (25 Feb - 8 Mar 2013), with topic: Magnetism for Energy. Time-dependent phenomena in magnetism was the topic of the 2011 Summer School, part of the Series of the European School on Magnetism. 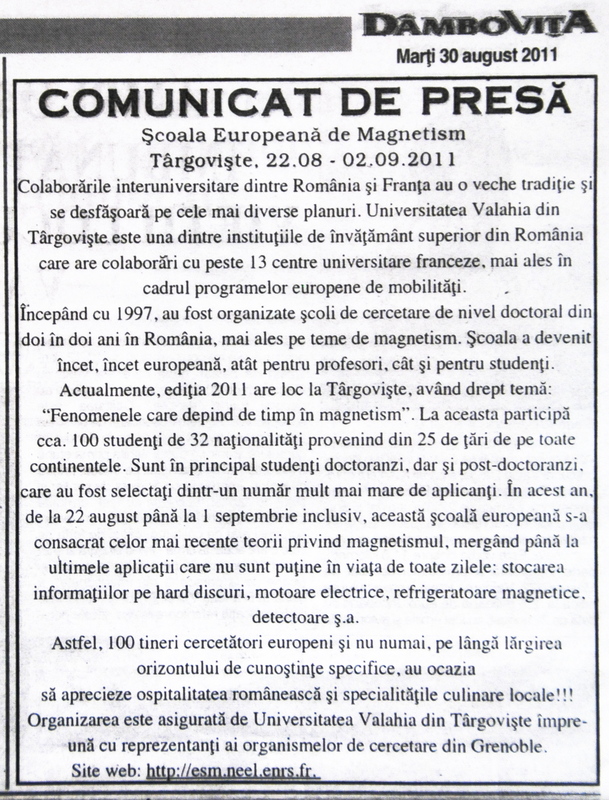 It took place from Aug.22nd to Sep.2nd in Târgovişte, Romania. Like previous editions of ESM, the 2011 School aimed at providing a thorough insight in Magnetism based on a broad series of fundamental lectures, while proposing the latest insights in today's Magnetism with lectures focusing on a special topic. The topic proposed in 2011, Time-dependent phenomena in magnetism, covers a wide range of phenomena from slow relaxation to femto-second dynamics, raising both fundamental issues of condensed matter physics, and opportunities for applications. The topics covered were: basic concepts, exchange interactions and magnetic ordering, coupling with the lattice, temperature effects, magnetization processes, magnetization dynamics at various time scales, and relevant experimental techniques. The School is addressed to young scientists, mainly PhD students and post-docs. It gathered 100 participants (mainly PhDs) coming from 25 different countries and with 32 different nationalities. It consisted of a ten-day training of lectures, tutorials, practicals and interactive question sessions, provided by prominent scientists active in today's research. This Web site is hosted and maintained by Institut Néel. The following organizations provide financial and/or technical support to the European School on Magnetism.